The Hill Pavilion is a new building within the University of Pennsylvania Veterinarian School. Michael Singer was commissioned to develop interior design concepts and interactive sculptural elements for the large ground floor public spaces and lobby. Collaborating with Potion, a media design firm and Richard Rabinowitz, an interpretive planner at American History Workshop, the team developed the Living Wall. 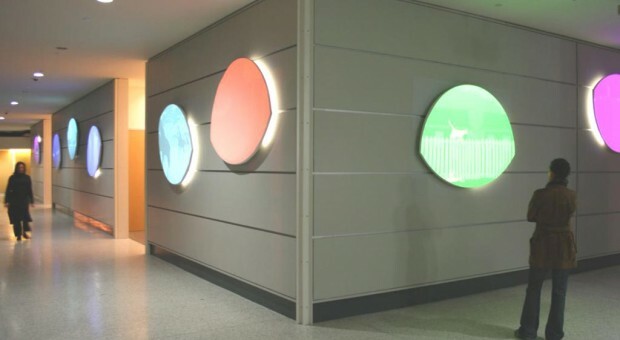 The wall is comprised of 9 specially sculpted and shaped screens that receive digital graphic projections, including 500 hours of visual and text information about all aspects of the Veterinary Program. On a large centrally located interior stairwell wall Singer designed a graphic interpretation using the school’s collection of Edward Muybridge’s animal motion studies. Many of these studies were done in the late 1800’s at the Veterinary School. The playful wall is visible through a glass curtain wall from an outdoor pathway.